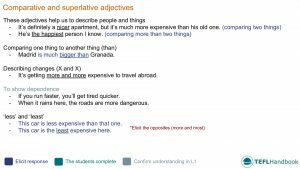 This ESL lesson plan contains activities and games for teaching comparative and superlative adjectives to intermediate level students (B1). Feel free to use these activity ideas in your ESL classes. If you're an iOS or Android user, try this lesson out on the TEFL Handbook app. It gives you offline access to all of our teaching resources, perfect for quick reference in the classroom. 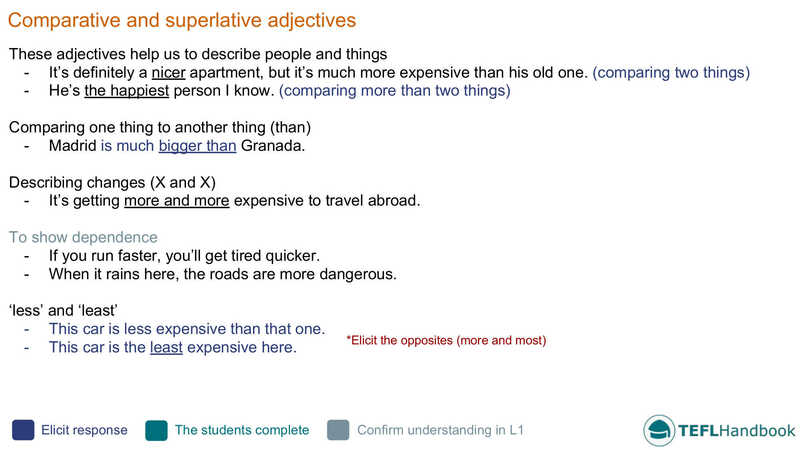 It's safe to assume that students at this level will be quite familiar with comparative and superlative adjectives. Therefore, you should be able to focus more on the functional uses and introduce more complex constructions. Step through the functional uses and try to elicit examples of each by giving the students a small part of the sentence. Students will complete the table individually before comparing their answers with a classmate. School children are younger than university students. University students are older than school children. Have them record and report back on the measurements as well. You can finish this activity with a group discussion where you ask follow up questions about each. Teacher: Where is the coldest place you have ever been? Teacher: Wow! And what were you doing there? Student: I was skiing with my family. For this ESL classroom game, you will need dice or dice app on your phone. To set this up, make a list of themes on the board and number them, six will be enough. Then make a separate list of 6 or 12 adjectives and number them. For each round, players roll the dice to select a theme and adjective. To win a point, they must then make a grammatically correct sentence from those selections. You can play this as a head to head, individual or team game. Give one point for a grammatically correct sentence. If you're playing a team game, give a bonus point to the team with the funniest sentence and set a time limit. If you've found these ideas useful, have a look our complete list of ESL lesson plans for intermediate level students. For other levels, see our entire collection of ESL lesson plans. Our suggested next lesson is on expressing ability and possibility.